Take your post frame estimate one step further. Design it in 3D! Seljax 3D Post Frame Estimating and Design software gives you the added marketing power of being able to quickly design a 3D rendering of your customers’ buildings, modify them to their specifications, and give them a complete and accurate estimate for exactly what you’ve designed. Seljax Estimating is a built-in component of 3D Post Frame Estimating and Design. 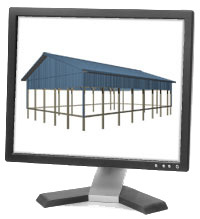 3D Post Frame is a complete package that gives you the power to design and modify post frame buildings, and then calculate the estimate from the 3D rendering. The speed and accuracy is always apparent, allowing you to create an exceptional 3D estimate.